Trainers at New York's Belmont Park will have both a world-class equine orthopedics facility and a world-renowned surgeon on site when a new equine hospital is completed in 2007. Patricia Hogan VMD ACVS traveled to Saratoga on August 24 to take part in a press conference organized by International Equine Acquisitions Holdings, Inc. (IEAH), the industry group that will fund the Belmont facility. Dr. Hogan confirmed that she will be serving as lead surgeon when the hospital is built. 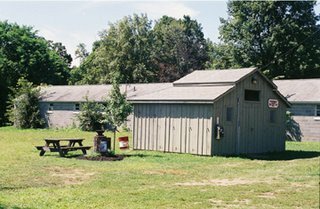 Plans call for an 11,500 square-foot, $7 million equine hospital designed to serve the needs of racing Thoroughbreds. The new facility will also have a treadmill for the evaluation of breathing problems as well as diagnostic imaging equipment. The hospital’s practice will be headed by James C. Hunt Jr., DVM. Hunt currently employs five veterinarians and services more than 50 percent of the horses in training at Belmont. 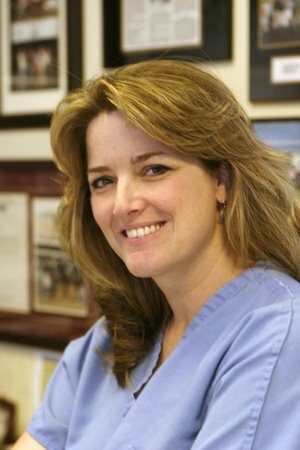 In a telephone interview this week, Hogan clarified that she will retain her current position as surgeon at New Jersey Equine Clinic in Clarksburg, New Jersey until the new hospital is completed and that in 2007 she hopes to perform surgeries at New Jersey Equine two days a week, while traveling to Belmont three days a week. This will enable her to continue to serve trainers at Philadelphia Park, Monmouth, and Delaware Park, as well as retain her connection with the Standardbred industry in New Jersey. Hogan noted that harness trainers and Thoroughbred trainers from other tracks would be able to ship cases to her at either Belmont or New Jersey Equine, although stalls may be limited at Belmont. Currently, Hogan lists about half of the trainers on her client list as New York-based. Hogan graduated from the University of Pennsylvania School of Veterinary Medicine, and completed an internship at Rood and Riddle Equine Hospital in Lexington, Kentucky, followed by a surgical residency at Texas A&M University’s College of Veterinary Medicine. As a Board-certified surgeon, earned by examination under the American College of Veterinary Surgeons, Hogan specializes in orthopedic surgery, particularly removal of bone fragments and chips, and the repair of fractures. She also performs corrective surgery on foals and laser surgery for upper airway problems. Among Hogan’s best-known cases have been Smarty Jones and Afleet Alex. Hogan was in the headlines earlier this summer as the only veterinarian to speak before Congress in favor of H.R. 503, also known as the American Horse Slaughter Prevention Act. The nation’s two leading veterinary organizations—the American Veterinary Medical Association and the American Association of Equine Practitioners—opposed the bill. This did not deter Hogan from speaking her feelings on the issue. “There had been no veterinary voice from the other side of the fence,” Hogan continued, referring to the AVMA/AAEP stance. Hogan’s eloquent testimony voiced concerns about the way that horses are held and transported before slaughter, as well as her warning about the unregulated amount of medication present in slaughtered horses. A transcript of her testimony circulated on the internet this summer, making Hogan something of a folk hero in the anti-slaughter camp. Hogan works with both the Thoroughbred Retirement Foundation and ReRun, and donates some surgeries for ex-racehorses. She is also active in re-homing Thoroughbreds and making them more adoptable. 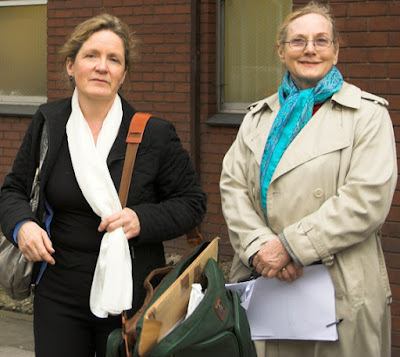 Mary Jo Kowalski, the Strasser-trained hoof trimmer found guilty of causing suffering to her foundered pony last month, with German veterinarian Hiltrud Strasser at a British court. According to the The International League for the Protection of Horses (ILPH) web site, a sentence has been given in British court to Mary Jo Kowalski, the Strasser-trained hoof trimmer found guilty of causing suffering to her foundered pony last month. The ILPH report continues: Kowalski had studied and used the Strasser technique in a belief that she would “cure” Brambles' laminitis. However, District Judge David Cooper did not agree and said in his judgement: “Was Brambles suffering? It is common ground that she was. Was the suffering necessary in the sense that it was inevitable? I am satisfied that it was not inevitable although dogmatic adherence to Dr Strasser’s methods may have made it appear so. Brambles' suffering could and should have been alleviated." He went on to say with reference to the second charge: “The well-intentioned mutilator does not have a defense”. Kowalski was given a sentence of 100 hours community service, banned from keeping horses, asses and mules for one year and ordered to pay £10,000 towards costs. 1st place ENGLAND(Beane, Bazin, Devereux and Darlow); 2nd place Wales (Blurton, Martin, Crothers, and Ellis); 3rd place France (Mathieu, Delcroit, Policard, and Baijot). On an individual basis in this class, Travis Koons' score placed him in fourth place....ahead of Crothers and Blurton! Todd Walker was 16th. Not to be forgotten is Aaron Gygax of the Swiss team, who finished 18th on his individual score. Aaron lives in the US and is employed as a farrier in the podiatry clinic at Rood and Riddle Equine Hospital in Lexington, KY. Stoneleigh was Aaron's first and only competition of the year! 1. Gary Darlow (England); 2. Darren Bazin (England); 3. Allan Ferrie (Scotland); highest place USA competitor was Travis Koons in 16th place. Other US competitor placings were Trey Green 25th, Billy Reed 26th, Bill Poor 27th, and Todd Walker 28th. Bruce Hauge of Canada was 30th and Aaron Gygax was 35th. 1 England (Beane, Bazin, Devereux and Darlow), 2 France (Mathieu, Delcroit, Policard, and Baijot), 3 Wales (Blurton, Martin, Crothers, and Ellis), followed by Scotland, Holland, USA, Canada, Norway. Todd Walker was 5th on his individual score, and Colain Duret of Canada was 14th. Thanks to Carl Bettison, manager of the English team, for sharing these results...and congratulations to anyone who survives that grueling competition! Mark Andrews, our intrepid colleague in England, has published a new edition of his "Equine Science Update", a handy newsletter about equine research and practice. He has written a summary of the scientific output from Waltham's Equine Studies Group in 2004 and 2005 . 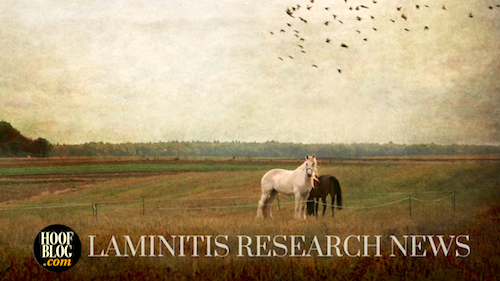 Several studies considered the nutritional aspects of laminitis. One showed that grasses with lower nutritive value (such as timothy), or pastures with lower water soluble carbohydrate (WSC) levels are associated with slower fermentation in the colon. Consequently they may be less likely to cause acidosis of the hindgut contents. Another study demonstrated the existence of marked insulin resistance and / or hyperactive insulin secretion in ponies prone to laminitis. The Worshipful Company of Farriers has honored an old friend to all readers of Hoofcare & Lameness Journal. 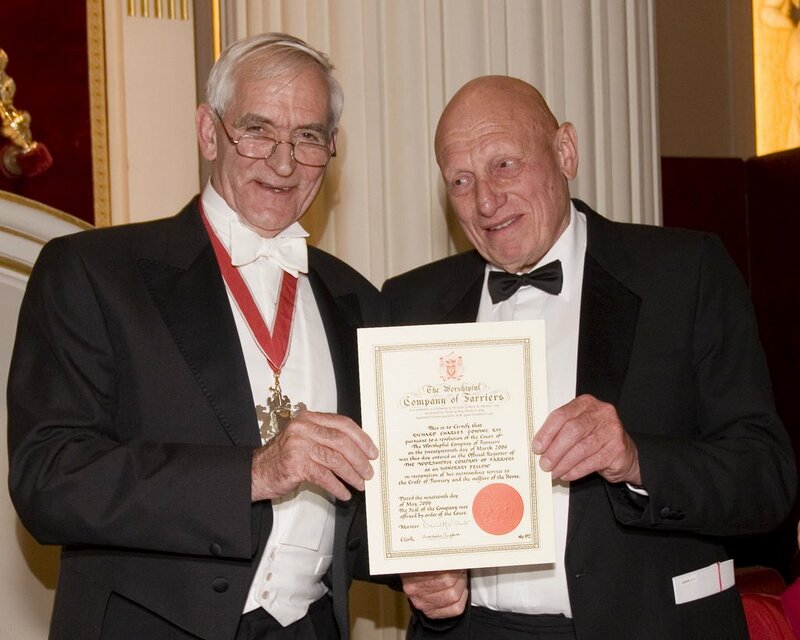 Mr. Richard Gowing of Suffolk, England is now an honorary Fellow of the Worshipful Company of Farriers (FWCF). The honor presentation stated Richard had made "...a major contribution to the profession of farriery...by organizing countless events, especially competitions, constantly promoting the art of farriery." Richard is best known as a leading judge and exhibitor of heavy horses, and a de facto statesman for the care of their hooves and legs. He checks all the shoes on all the horses entered in the famous Peterborough Shire Show and is past president of both the Percheron and Shire associations in Great Britain. A few years ago, Richard was president of the National Farriers Association in the UK, and made the trip to Lexington, KY for the AFA convention. I remember thinking how odd it was that such a talented man was in the midst of the convention and did not have a bigger role. His spirit and generosity are as huge as the horses he cares so much for. On countless trips to Great Britain, Richard has extended friendship and hospitality to me and, I am sure, to dozens of American farriers and horsemen. It is very nice to see this sort of honor bestowed to a living farrier. I am not sure that I have heard of the WCF doing such a thing before, but then I am not sure there has been a fellow quite like Richard Gowing ever before. 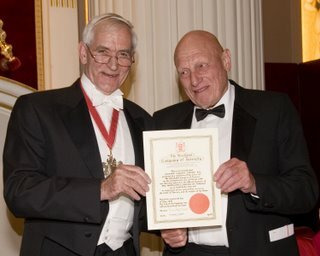 Note: in the photo, I believe that is the Master of the Company, David Short, presenting the Fellowship to Richard, who is on the right. Billed as the largest horse show in North America, it boasts 4,570 entries for an 11-day show, a ten year waiting list for box seats, and $650,000 in prize money but the 68th Annual Tennessee Walking Horse National Celebration in Shelbyville, Tennessee was suspended after two classes had been completed on Friday. At issue: the USDA's federal mandate to examine horses to make sure they are not "sore"; the Walking Horse trainers want to do their own inspections. At other shows earlier in the year, trainers simply refused to show, and sometimes didn't even unload their horses, if the USDA's veterinary inspectors showed up. Some shows are large charity fundraisers, and they simply didn't take place. The Celebration is by far the largest showcase of the breed and this type of showing, and not all classes ask horses to do "the big lick" type of gait. The show has arranged for streaming video on the internet and even pay-per-view on cable television, in addition to selling thousands of reserved-seat tickets. According to the Shelbyville Times-Gazette, "Trainers decided not to show because USDA inspectors were checking every horse presented for inspection, an unprecedented procedure. The requests (to cancel Friday night and Saturday classes) were made to allow for meetings between the Trainers' Association, the National Horse Show Commission and the United States Department of Agriculture. Attempts at reaching a resolution to the conflicts concerning the inspection of horses prior to showing, especially concerning what is known as the scar rule, failed Friday night, prompting the cancellation." The newspaper also says, "The USDA inspectors arrived midway through the show Thursday night, but did not inspect any horses. Friday night the USDA inspectors took an active role in the inspection process. According to reports, more than 30 horses were turned down in the first two classes, including nine in a row. Apparently, the inspection of horses participating in the Two-Year-Old Gelding class forced the trainers to make their request. "Attorney David Broderick of Bowling Green, Ky., told Tennessee Walking Horse owners on Saturday afternoon that a lawsuit filed earlier this summer is seeking clarification of the enforcement of the Horse Protection Act and could provide some long-term answers to the dispute between the industry and U.S. Department of Agriculture regulators. "Industry personnel claim that federal regulators are being unfair in their inspections of walking horses, resulting in horses being unfairly excluded from competition. For example, Broderick said the technique of palpation, or examining a horse's leg for sensitivity by means of an inspector's touch, is sometimes done in too forceful a manner. "Owners discussed other possible solutions with Broderick, including pressuring horse shows to hire veterinarians instead of designated qualified persons (DQPs) to inspect horse shows. It's also possible that horse owners will hire veterinarians to inspect horses before sending them into competition, in order to gather evidence which could be used to challenge the federal inspection techniques. At the 100th anniversary Wartrace show earlier this month, many trainers opted not to show rather than subject their horses to inspection. At that show, a junior exhibitor's father complained, 'There are more people watching the inspectors than watching the horse show'," according to the newspaper. An endurance horse has died at the World Equestrian Games. The Anglo-Arab name "Dubai" began to tie up severely early into the competition and was immediately withdrawn and treated but later died at the referral hospital affiliated with the Games. The American dressage horse Brentina has been withdrawn from the individual competition after helping the USA team secure the bronze medal in the team competition. Ridden by Debbie MacDonald, the mare has filling in a hind leg and has been pulled from the roster. Gunter Siedel will take Debbie's place. Haydn Price is team farrier for Great Britain; Steve Teichman is handling duties for the USA. They plan to get together today. Meanwhile, the farrier/vet conference is underway; no news yet from that corner of the horsey town in eastern Germany! Millions of Americans woke up this morning to see Barbaro and Dr Dean Richardson on the CBS "Early Show". Here's a link to a video of the segment, although I do not know how long this link will be active. People here in Saratoga haven't forgotten the tragic death last year of the promising young racehorse Saratoga County in a local vet hospital. Saratoga County was one of several horses that developed colitis-like conditions that have been linked to the use of what is believed to have been a contaminated or improperly manufactured medication. Severe laminitis is a common side effect of colitis and three of the four horses developed the hoof disease and were euthanized. A fourth horse at Belmont also received the medication and developed colitis and laminitis and was euthanized. According to the Journal of American Veterinary Medical Association, the pharmacy is being sued for the alleged wrongful deaths of the horses. 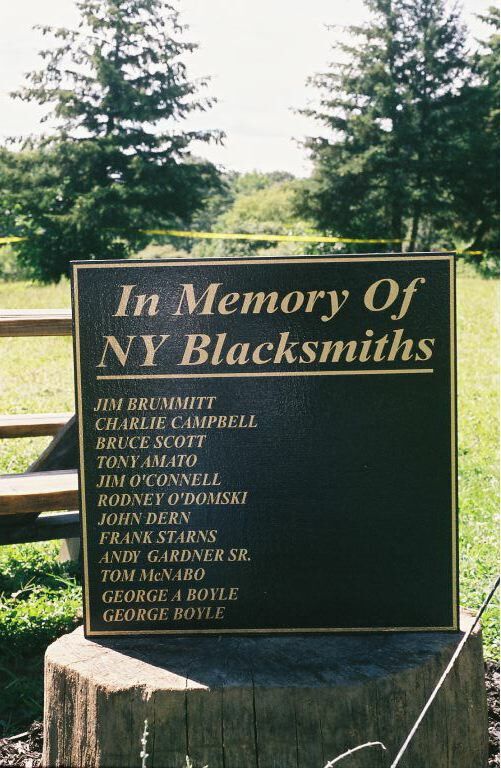 Henry Wadsworth Longfellow would have approved: On Tuesday morning, August 15th, recently-deceased Saratoga horseshoers were remembered in a memorial service at the horseman’s blacksmith shop behind the Oklahoma training track. 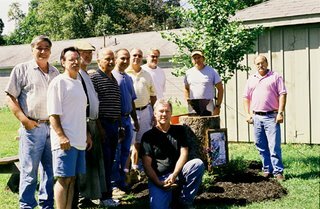 Their living shoer friends stood around an anvil, under a tree, to honor them. Jim Brummitt, Charlie Campbell, and Bruce Scott were familiar faces around Saratoga, and all three became ill and died last year at what should have been the heights of their careers. Charlie was the paddock farrier at Saratoga until his death; his twin brother Joe has taken over for him now. A group of friends of the three pulled together and raised funds to create a memorial area by the blacksmith shop. A fresh young gingko tree, a picturesque anvil on a stump and plaques in remembrance of many deceased track shoers were dedicated. The names on the plaque are: Jim Brummit, Charlie Campbell, Bruce Scott, Tony Amato. Jim O'Connell, Rodney O'Domski, John Dern, Frank Starns, Andy Gardner Sr., Tom McNabo, George A. Boyle, and George Boyle. About 20 current horseshoers showed up for the service, which included prayers lead by former jockey Pat Day. He thanked the farriers for the part they played in making it safe for jockeys to ride in races. I looked around and I noticed that none of them was younger than 40 or so. Where is the next generation of New York racetrack shoers? Maybe, because Tuesday is the dark day at Saratoga, they all had the day off. I'm very glad I was able to be there for the dedication. It was a terrible shock for me to learn that Rodney O'Domski had died. I knew him quite well a long time ago when he was the farrier at Coolmore in Ireland and only learned of his death when I read the plaque. Gingko is an herb that is supposed to prevent memory loss...an appropriate choice for a memorial tree. Ray Amato promised he'd help me identify all the horseshoers in the photo; as soon as I have all the names, I will edit this post. Dr. Chris Pollitt of the University of Queensland and director of the Australian Equine Laminitis Research Unit (AELRU) is recovering from injuries suffered both when he was kicked in the face by a horse and difficulties under anesthesia during surgery to repair broken facial structures and his nose. Dr. Pollitt is a key contributor to Hoofcare & Lameness Journal; issue 80 contains information about his research to prevent laminitis using cryotherapy (intensive icing of the feet and legs). Chris's smile may be a little crooked, but we should all be extra delighted to see him. 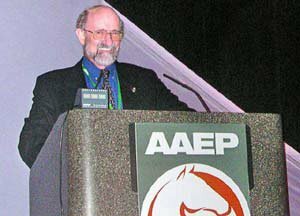 In the USA, Dr. Pollitt is expected to attend the AAEP Convention in San Antonio, Texas in December. He is not a speaker, but will support his students and staff who are presenting new research from the AELRU. He has agreed to be a special guest at a gathering of Hoofcare & Lameness subscribers, tentatively planned for Monday evening of that event. This just in from the TradeArabia news service: A Dh1.6 billion ($435 million) equine tourist attraction will be built at the Dubailand's Eco Zone area in the coming years, a report said. "Al Kaheel Park will become the most comprehensive equine tourist attraction ever built. It will extend over almost 10 million sq ft of preserved desert landscape. Destined to be like no other horse centre in the world, Al Kaheel will be the ultimate equine experience," the Gulf News report said quoting a press statement. Al Kaheel will be an educational theme park and working horse farm dedicated to man's relationship with the horse. Strategically located in the heart of the desert in Dubai, the homeland for the Arabian horse, the park will be the place to get "up close and personal" with horses. Every evening, "Fly Without Wings", a nightly production of light, sound and action, featuring world class equine acts with over 45 performers and over 70 horses, will be held. In addition, the park will boast the world's first interactive and multimedia museum. Daily attractions such as virtual reality rides, stunt shows, horse presentations, hay rides, desert trekking to horse drawn carriage tours will be on offer. It reminds me of the nonsensical excuses that people give me for not belonging to professional organizations or subscribing to magazines. You're not marrying the concept, you're just opening yourself to some potential benefit that might at some point come your way, if you are open to it, and you are opening the door for your own opportunity to give something back to your profession or field of interest, if you feel like it. End of sermon. It must be the heat. ...Saratoga actually cancelled racing today. Now, if you have ever been to Saratoga, you know they invented "hot" there. I have been miserable there more times than anywhere else on the planet. They have misting fans at the finish line for the horses but they could use a few in the grandstand, too. I see the old photos of women in Victorian garb and men in starched collars and I just don't see how they stood it. It's probably in the best interest of the horses--although I don't know how cool they will be in their stalls, either. The nice thing about Saratoga is that there's a a lot of shade. I don't recall them ever cancelling racing for heat before. Thunderstorms, yes. What about all those people with their precious tickets for reserved seats? What happens to them? >>Due to severe heat and humidity that has plagued the entire East coast, Saratoga Race Course has canceled its nine-race program today. In a morning meeting with trainers, jockeys, the track veterinarian, stewards, track superintendent and senior management, a unanimous decision was reached to call off the races at 8:12 a.m. today. The International League for Protection of Horses is “pleased” that Mrs Jo Kowalski of Baylham, Ipswich in Suffolk, England was found guilty of causing suffering to her pony Brambles at Ipswich Magistrates Court recently. She will be sentenced on Wednesday, 30th August. This is the second time in recent months that someone using the Strasser technique has been successfully prosecuted. Mrs Kowalski caused this pony to suffer by allowing many months to go past when the pony was in severe and obvious pain. Mrs. Kowalski, who was a qualified Strasser Hoof Care Technician, failed to accept that the Strasser technique was unable to treat the pony’s laminitis problem. ILPH Farrier John Blake who treated Brambles on arrival said: “Brambles was possibly the lamest animal I have seen in 26 years as a farrier. Mutilated is the best way to describe her." You can view an interview with John Blake which includes footage of Brambles arriving at the ILPH in the ILPH Media Centre. This is the second time the Strasser technique has been shown to cause suffering in a British court of law. Both the ILPH and the RSPCA hope that people will treat this method with caution. Note: this blog is an interactive web page. By clicking on the envelope icon at the bottom of an article, you can instantly email that article to a friend. By clicking on the word “comment” after a post, you can leave a message, which may be viewed by future blog readers who click on the same “comment”. Commenting may require registering with Blogger.com. You may also comment by emailing the author, Fran Jurga, at fran@hoofcare.com and your comment will be posted for you, technology willing.